It's not very often you get contacted by SEGA out of the blue, nor is it very often you're given the chance to have some questions answered by one of the original creators of NiGHTS into Dreams -represented- by SEGA. Ohohoh. Mr AAUK went armed with a selection of obscure questions I'd written up regarding both the original and the new game. Thanks to Mike Taylor from NintendoLife we have audio/video and a transcript of the interview. Mike was also there asking questions along with G from SEGANerds. Consider the following to be the 'epic combi meal' of our Websites' joint efforts. Nintendo Life: When did development for Journey of Dreams start? Nintendo Life: Years ago rumors came about, for a game called Air NiGHTS, a proposed sequel for the original game. Motion control was rumored to be the main idea for the game back then. Was Air NiGHTS a real game, and did it have any bearing on Journey of Dreams? Takashi Iizuka: At the time SEGA had been playing with the idea of motion control on their consoles. Air Nights was a prototype game testing out the technology. Nothing came of it, and development stopped. SEGANerds: Where did you come up with the idea for the My Dream segment of the game? Takashi Iizuka: It was developed from the A-Life system in the original NiGHTS. While the original only allowed you to interact with A-Life in the missions. You now have a separate, small world, the beauty of A-Life, is it creates a place where the developers will not be able to predict what will happen. SEGANerds: Why did you decide to give NiGHTS a voice? And why did you choose a female voice? Takashi Iizuka: [LAUGHS] Well the original game had voice clips for NiGHTS, but in Journey of Dreams I wanted to use more voice acting. The voice helps to add depth to the game play, and tell the story in the cut scenes. NiGHTS is neutral, and therefore has no gender. The impressions of the character with regards to gender are totally up to the player. SEGANerds: Will there be any unlockable content in Journey of Dreams? Like with Christmas NiGHTS – you could unlock Sonic. Takashi Iizuka: There will be some unlockable features, but I cannot say what they are. They are meant to be a surprise. But if players get high rankings, they will unlock features. SEGANerds: Is there anything you would have liked to have changed or added to the final release of Journey of Dreams? Takashi Iizuka: No, nothing more. I feel that we have implemented everything we wanted to. I think we did everything we could do with the Wii’s features. Nintendo Life: [JOKES] Nothing more you could so. Perfect! SEGANerds: Which control method do you prefer? 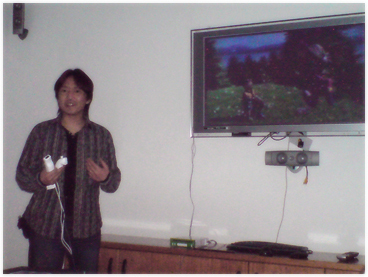 Takashi Iizuka: I personally prefer the Wiimote controls, as you get the feeling of free flying with these controls. But I suggest that fans of the original may wish to use the GameCube controller, as it is more like the Saturn controller, and is what players will be used to, at least at first. NiGHTSintoDreams.com: Some people say that BellBridge (the game’s fictional setting), resembles parts of London. Is there any truth to this? And if so, why did you choose this setting? Takashi Iizuka: Well like the character of Sonic is designed to be more like American style, NiGHTS has been designed to be more like that of European. So that is why the stages have the look of a more European setting. It is also why the characters in NiGHTS have English accents. NiGHTSintoDreams.com: How many people worked on NiGHTS Journey of Dreams? Takashi Iizuka: There were 26 developers from Sonic Team USA working on the game. With the sound and CG developed in Japan. NiGHTSintoDreams.com: Why was Jackle not included in Journey of Dreams? Is the Chameleon boss meant to be a replacement? In addition, will we see Jackle again? Takashi Iizuka: [LAUGHS] Well really I like the character, but if we created all the characters again we would be looking at the same game. We only wanted to keep Wizeman and Reala. [LAUGHS] It is a new game. (*)NiGHTSintoDreams.com: The second biggest mystery of NiGHTS! What did the deleted boss Selph look like? Apparently there was a deleted boss from the original game called Selph. Takashi Iizuka: [LAUGHS] How do you know about Selph? Takashi Iizuka: [LAUGHS] They, who is they? Takashi Iizuka: [LAUGHS] Ah, ok.
Nintendo Life: In Journey of Dreams, NiGHTS has different masks, which he can use. What is your favourite mask? Takashi Iizuka: It depends on the situation; I like the Rocket mask because you can use it to create your own strategy. But my favourite will have to be the Dragon mask. Nintendo Life: While we were having a play of your game a little while ago, we noticed that there is a counter in the game. The counter seems to change with each night you play. Does this have any effect on the game at all? Takashi Iizuka: No. It is just there as a counter, for you to know how long/many times you have been playing. SEGANerds: NiGHTS used the Saturn’s internal clock to add new game play/secrets to the game, depending on the date. Will the same feature be used in Journey of Dreams? Takashi Iizuka: No. For the Saturn, it was a new feature and a new challenge. With the Wii, the Forecast Channel is the new challenge. However there will be seasonal events within the game, which will appear in the My Dreams section. Nintendo Life: It has recently been announced that NiGHTS is being remade for the PS2. Will the game be released worldwide? In addition, are there any plans for a Wii version, perhaps on the Virtual Console? Takashi Iizuka: There are currently no plans for the PS2 version to be released outside of Japan. Takashi Iizuka: [LAUGHS] It is being released in Japan, due to the high demand for the game. So there are no plans for a worldwide release… for now. As for Virtual Console there are no plans for a release either… for now. NiGHTSintoDreams.com: For gamers who played NiGHTS into Dreams obsessively, you could unlock rare Nightopians called King or Superpians. Will there be any rare Nightopians in Journey of Dreams? Takashi Iizuka: In the My Dreams section of the game it is possible to mix Nightopians with the Marens (baddies) to create new creatures. There will also be Superpians. Nintendo Life: Thank you very much, for your time and for making a new NiGHTS game. Are we finished yet? Heck no! The following Monday morning we were sent a parcel of glee from SEGA, fiendishly gathered together during a meeting with Iizuka-san later on to discuss our lovely fanbase (THAT'S YOU GUYS). Here's some pictures of our amazing Christmas gifts! The unreleased USA BoxArt… signed by Iizuka! And as a super extra Christmas gift Arch' showed Iizuka some of my most popular pieces of old artwork. Iizuka was 'very very very impressed' and apparently 'enthralled'. Paradox was his favourite one. Aha I'm a big sap and cried about it. Dude. Then… HE SIGNED MY ARTWORK O_O… I kid you not. SEGA we still adore you T_T even after all these years, it's seriously heartwarming to see the creators connect to their fans in this way. Translator to Iizuka- "What is it? Such a boss was in the plan of original NiGHTS?" Takashi Iizuka to translator- "Yeah, it's true. I had thought I wanna add a boss called Selph to original NiGHTS." Translator to Iizuka- "Well, is it ok if I tell it (in English)?" Takashi Iizuka to translator- "OK. Maybe Naka had already told it before." Translator to Iizuka- "Ah, so they know… But why was it deleted?" Takashi Iizuka- "Because… The original story of NiGHTS already had been made perfectly. So I thought the boss isn't needed anymore. So I deleted Selph." And that's the truth behind the famous deleted boss, Selph. Iizuka himself was responsible for Selph's deletion. This most certainly wraps up the entire myth as to what Selph originaly was, and now we know. He was indeed 100% a boss character but was removed because the story was as good as it could be….which now brings up the speculation as to what made Selph so important that he changed the flow of the story. NiGHTS fanbase – we're a sneaky lot.